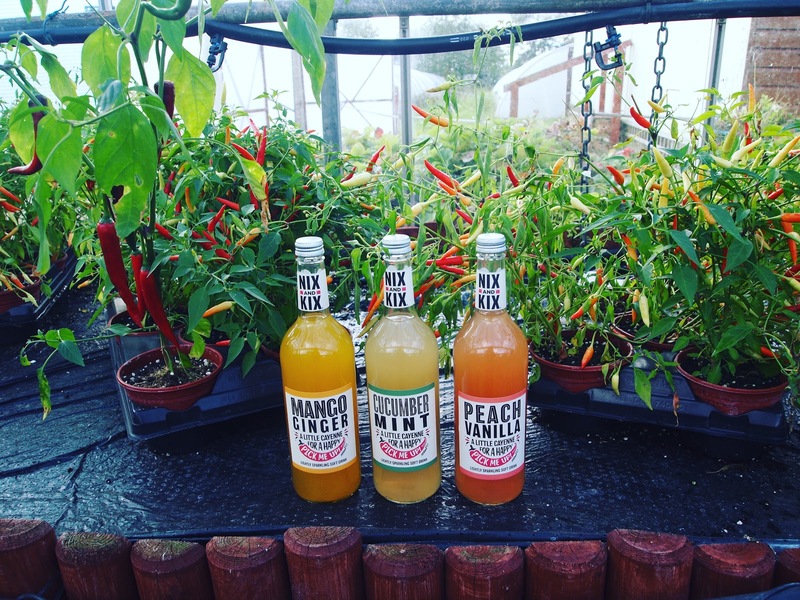 Last week I spent a marvellous day on a real life Chilli Ranch (yes, they exist!) hidden away just twenty minutes drive from my door in Bedford. 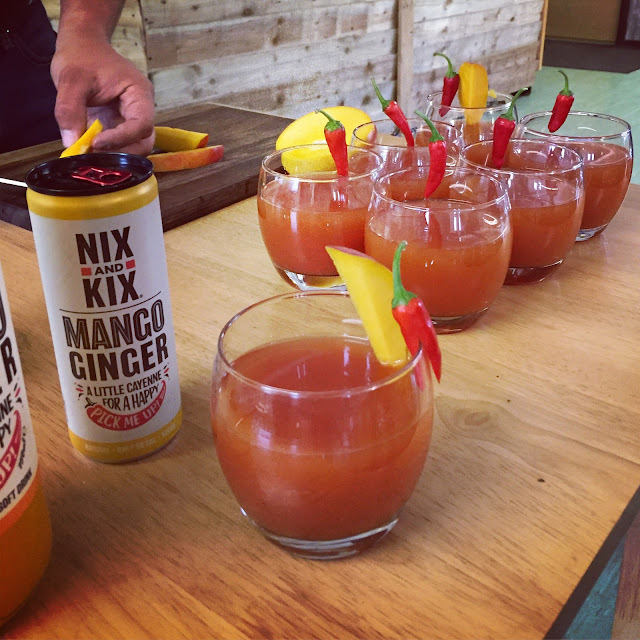 I'd kindly been invited to spend a day immersing myself in all-things-chilli with the luxury sparkling drinks brand NIX&KIX. If you've not heard of them before, NIX&KIX produce a beautiful selection of sparkling soft drinks with no added sugar or chemicals in a mixture of the most gorgeous fruity flavours, each with a little kick of cayenne pepper for a little pick me up. I absolutely adore these drinks, and although dubious about the added chilli before tasting - I'm now a complete convert - the added zing from the chilli really perks you up, enhances the flavour and boosts your metabolism and produces happy hormones - what's not to love? The NIX&KIX team source all of the fresh chillies for their drinks from Edible Ornamentals, the chilli ranch in Bedfordshire and they kindly invited me along to spend the day with them on the ranch seeing where and how the chillies are grown and to have some fun cooking and making cocktails (all using chilli, naturally!) 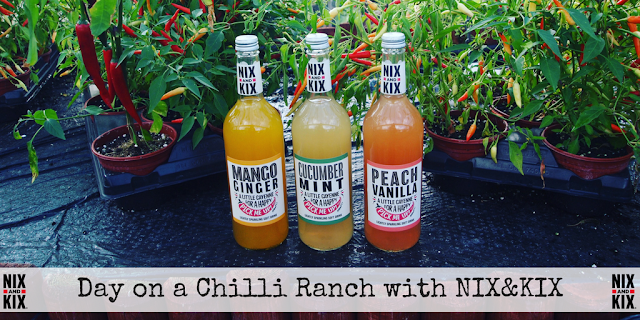 with the chilli ranch team. 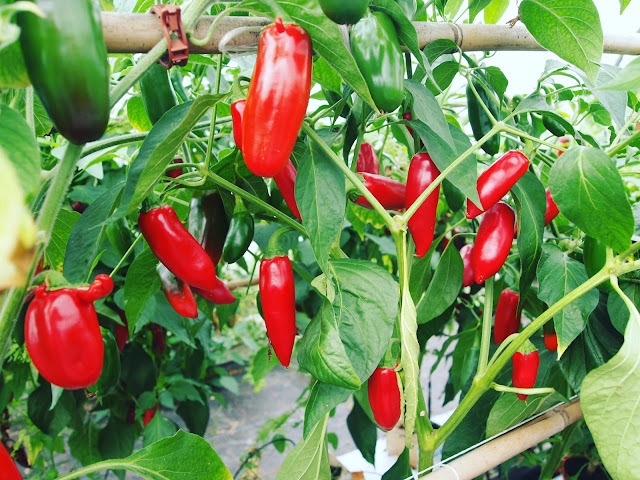 On arrival at the chilli ranch I was greeted by the lovely Olly (ChilliOlly - leading chilli chef, product developer and partner at Edible Ornamentals).Olly made me a chilli tea (AMAZING way to wake yourself up in the morning) and we sat chatting along with my lovely friend Amanda (Ginger Mum Blog) who also came to the ranch with me - we relaxed in the restaurant/shop on site at the chilli ranch, before owner Shaun took us on an amazing tour of the ranch. 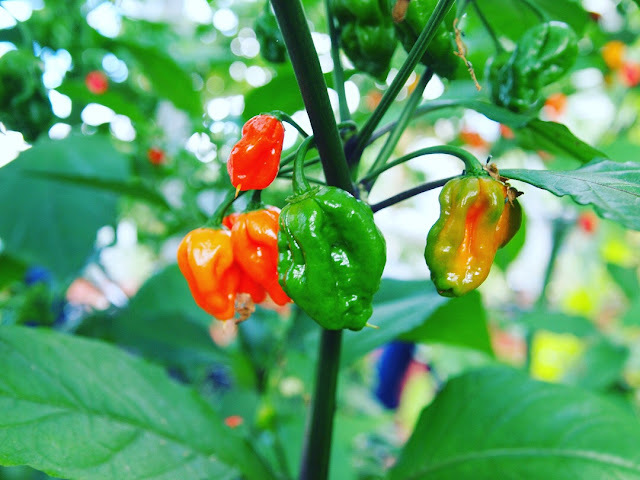 Jalapeno, Anaheim, Poblano, Padron, Lemon Drop, Dorset Naga, Scotch Bonnet, Ghost Chilli, and the Chocolate Habanero (which doesn't taste like chocolate but is chocolate brown in colour when ripe!) all of which Shaun grows at Edible Ornamentals. 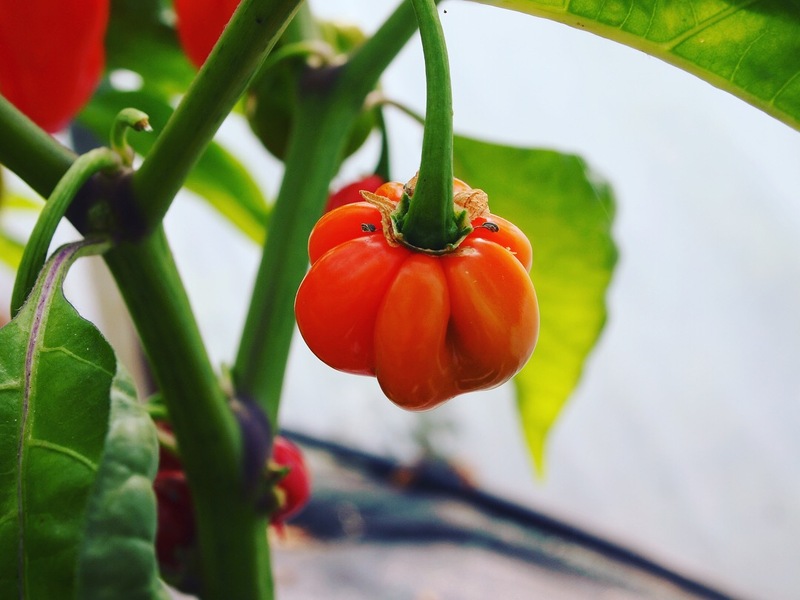 Aww I loved this tiny pumpkin-shaped chilli, cute! 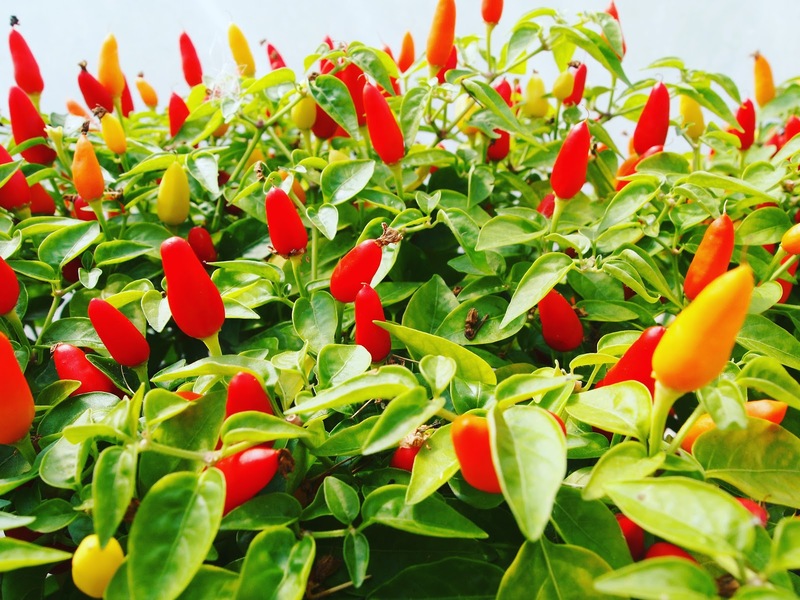 A chilli filled hanging basket - I need this in my life! 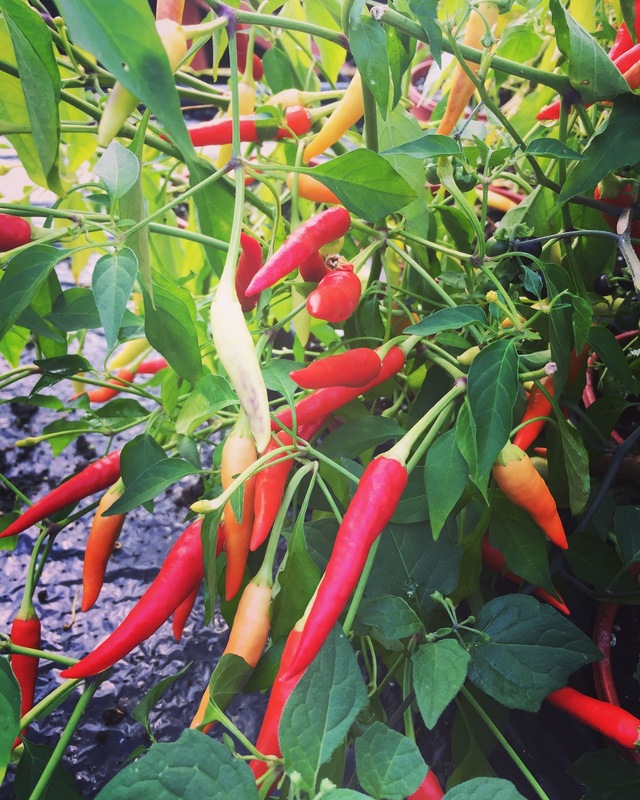 After our amazing tour, we headed into the Edible Ornamentals Chilli Academy for a chilli tasting and cooking session with chilli chef extraordinaire Chilli-Olly. I loved tasting such a variety of chillies from the humble jalapeño to the fiery citrus lemon drop and uber hot chocolate habanero - all of which I loved. 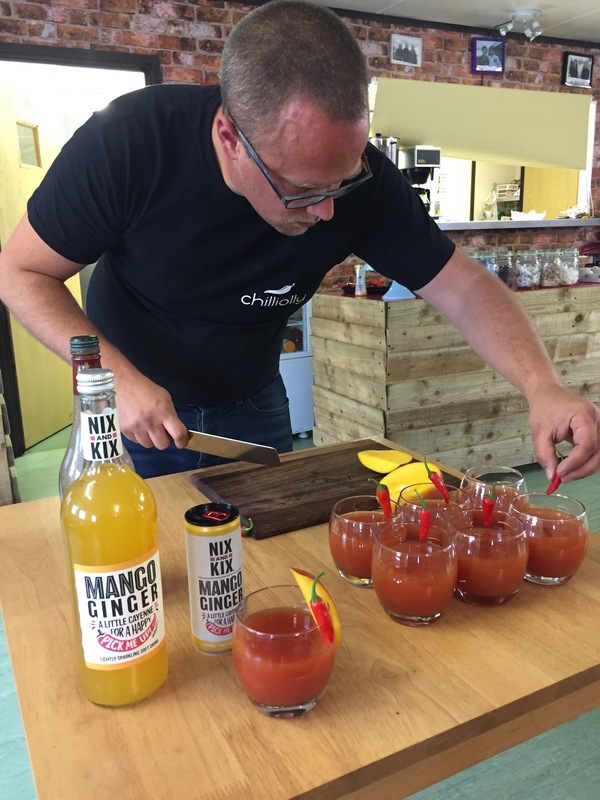 Olly then introduced us to his range of foodie products (which have won numerous awards) including sweet chilli sauce (to DIE for), chocolate chilli peanut butter (think Nutella on STEROIDS) and berry burst jam - all of which were really quite special. 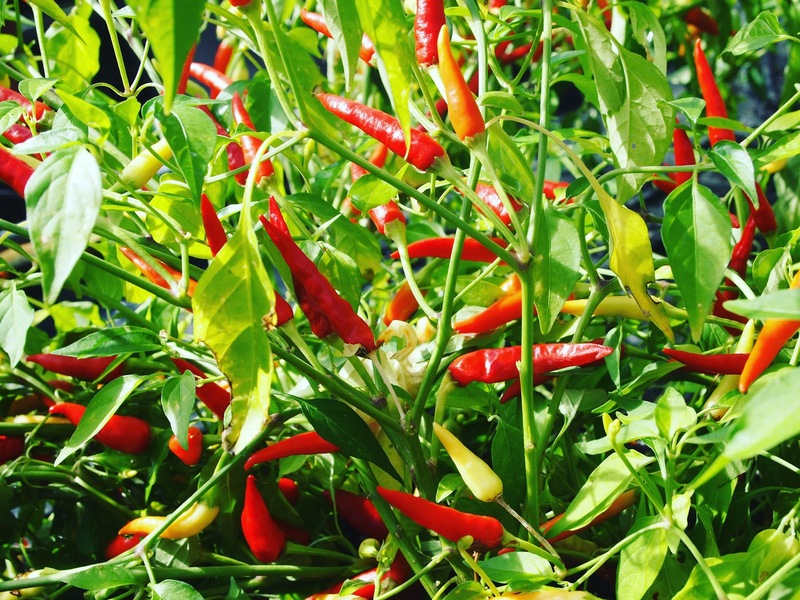 Following on from the tasting we got set free on the Chilli Academy kitchen which was full to bursting with beautiful fresh ingredients - and using some of the chillies we had just picked, we set to work making our own signature chilli sauce, salsa or jam. 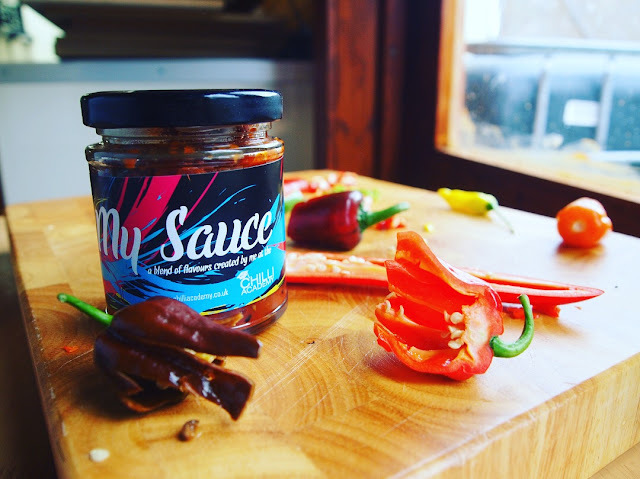 I created a chunky salsa containing a mixture of red onion, garlic, fresh ginger, nigella seeds and tinned tomatoes with jalapeño, chocolate habanero and lemon drop chillies - a very fiery combination (I like things HOT). I have to say that even though I made it, it's really excellent. We've used one whole jar out of the two jars I made already (less than a week later), hubby loves it too - and it's really versatile. 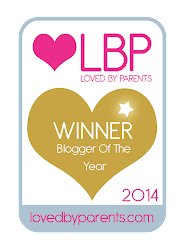 Hopefully I can just about remember the quantities to whip up another batch when we run out! After getting our cook on we were treated to a slap up home cooked lunch, lovingly made for us on site in the Chilli Ranch Restaurant which included: warm bread with chilli oil & balsamic dip to start, pork meatballs in a spicy tomato sauce with spaghetti and a vegetable bake with crispy top for main course. We finished with some delicate chocolate and lemon custard filled pastries. *HEAVEN* I need to re-create this whole menu at home soon! Our lovely lunch was accompanied by fiery cocktails (who doesn't love a cocktail or 3 at 2pm on Thursday afternoon...!) 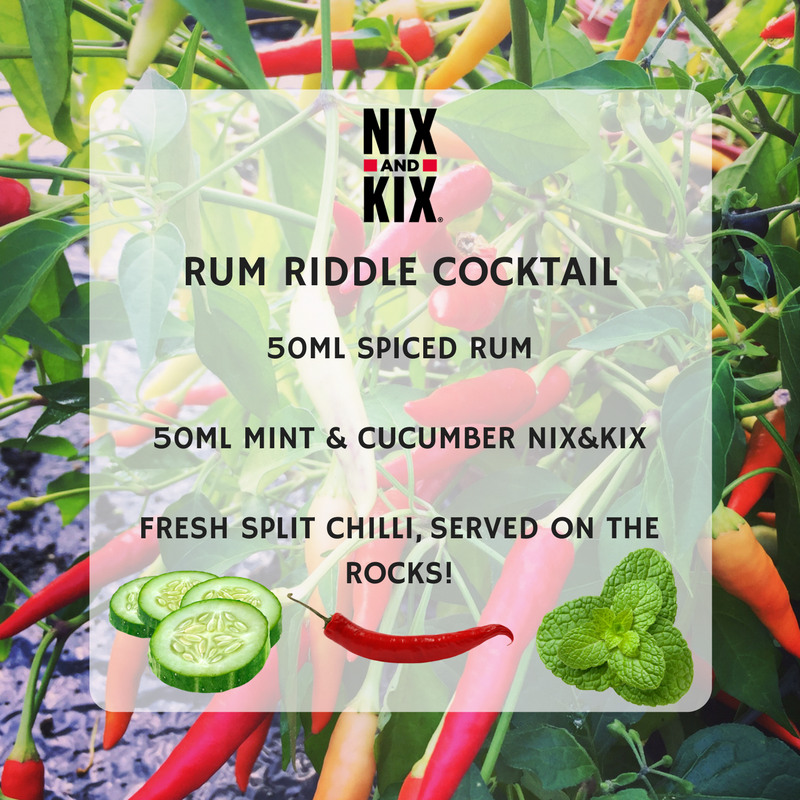 Olly has developed three rather marvellous concoctions using NIX&KIX drinks at the centre of each cocktail recipe, and of course the humble chilli rears its hot head in each drink too (naturally!). 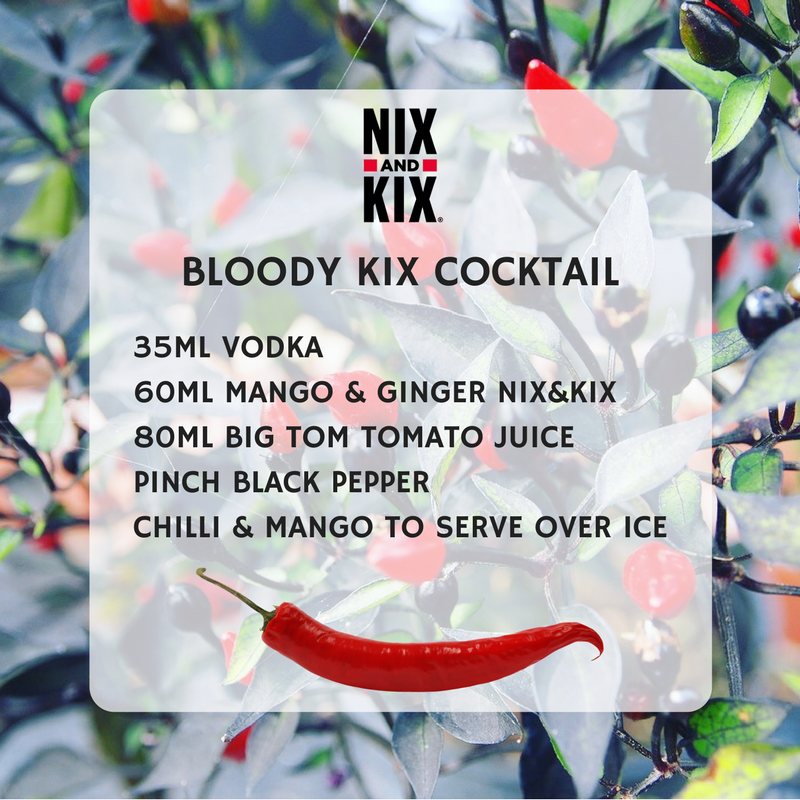 My absolute favourite was the Bloody Kix cocktail - but whatever you're tipple of choice, there'll be something here you'll love. 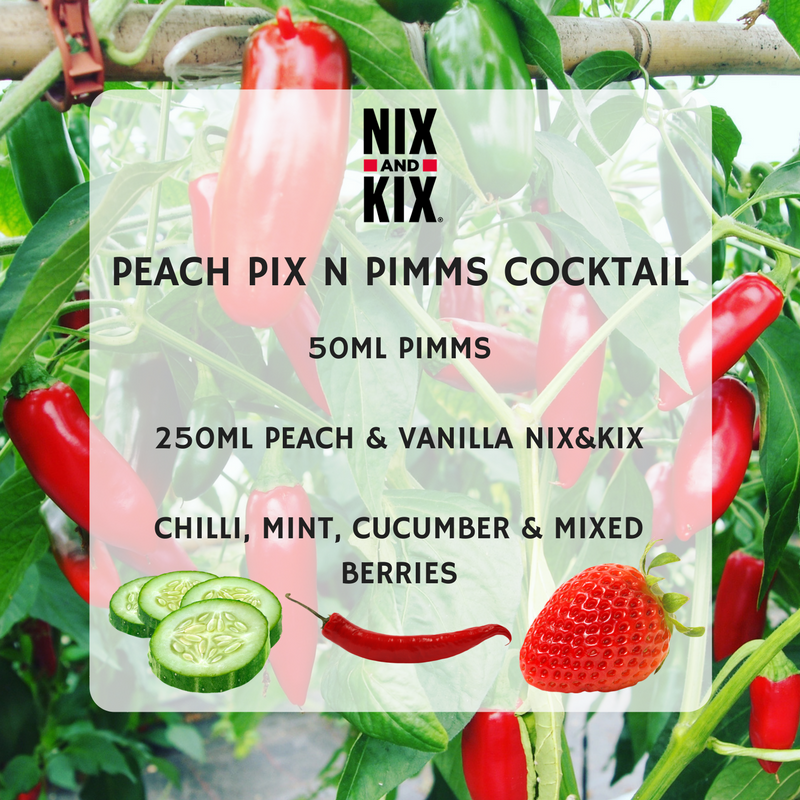 Three recipes: one vodka, one Pimms, one spiced rum > what's not to love? 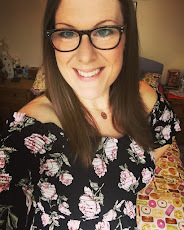 Here are the recipes...give them a go, I'd love to hear what you think! Cocktails aside, I spent all day drinking NIX&KIX cans - at only 50 calories per can, I really didn't worry about drinking one of each flavour: Peach & Vanilla, Mango & Ginger and Cucumber & Mint (my fave!) *HINT* They're especially good with a shot of gin thrown in, I like to call it 'The Lucy'. You're welcome. We finished our day chattering over cocktails and I was kindly given some beautiful chilli plants to take home: an Adorno chilli (left) and Super Chilli F1 (right), as well as some of the amazing products from the Edible Ornamentals shop (keep an eye on my social platforms for more about these). 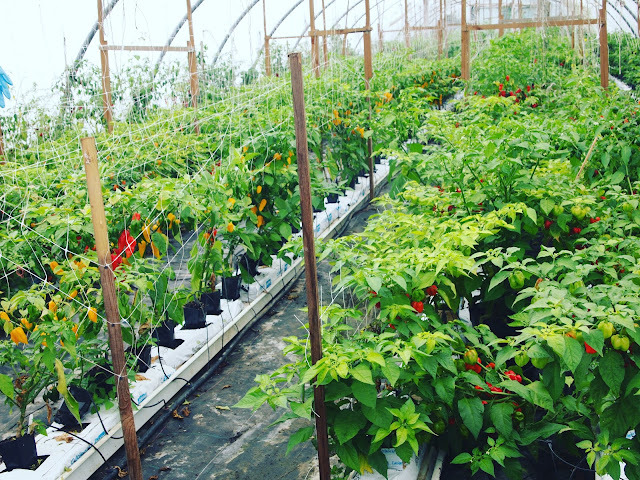 I can't tell you how amazing it was to see first hand where the chillies for NIX&KIX are sourced, and to understand the dedication, love, and knowledge that goes into to growing the chillies commercially. 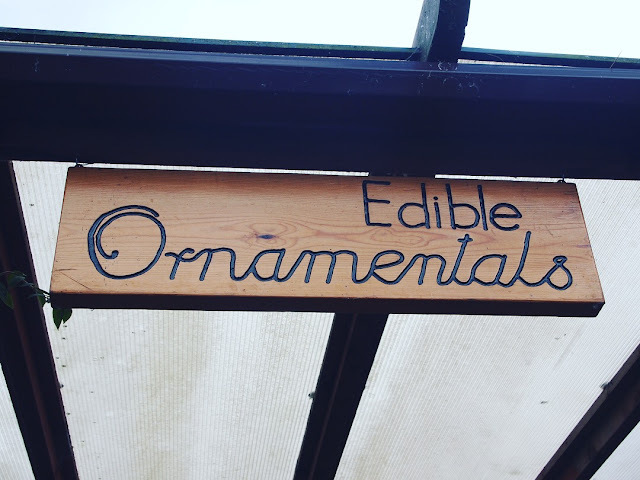 Edible Ornamentals blew me away - a business prided on down-to-earth, love-what-we-do passion, one of the friendliest bunch of people you could hope to meet: I'll definitely be heading back there for more PYO, some of their cookery courses, and to sample more of their restaurant menu. I even heard on the grapevine they do a chilli afternoon tea - YES PLEASE! 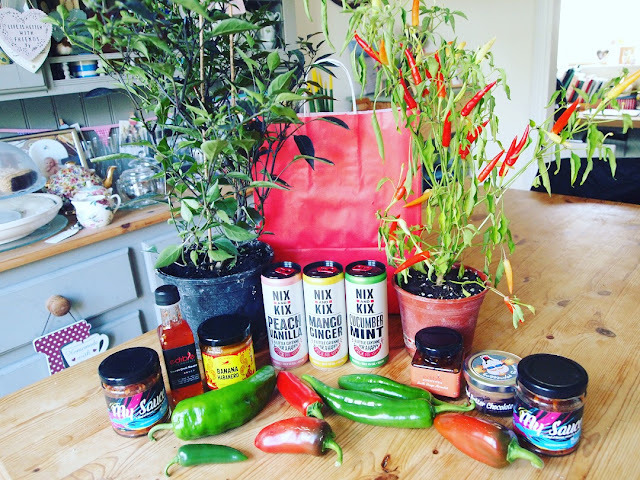 If you haven't given NIX&KIX a try yet you can find them in a selection of shops and restaurants across London, at Edible Ornamentals in Bedford or of course, you can buy them on their website.